I absolutely love discovering cheap bookshops. So imagine how delighted I was when walking around my new neighbourhood this weekend I found one just around the corner! Bookscene has something for everyone. There is a particularly large science-fiction and horror/crime section, but there is plenty more on offer here. Not being the hugest fan of science-fiction, I headed straight over to the general fiction shelf and was happy to find that there was a lot of choice. I was even happier when I saw the prices! A book for 75p? Could I have read that right? It was then a struggle not to grab books by the handful and buy them all! 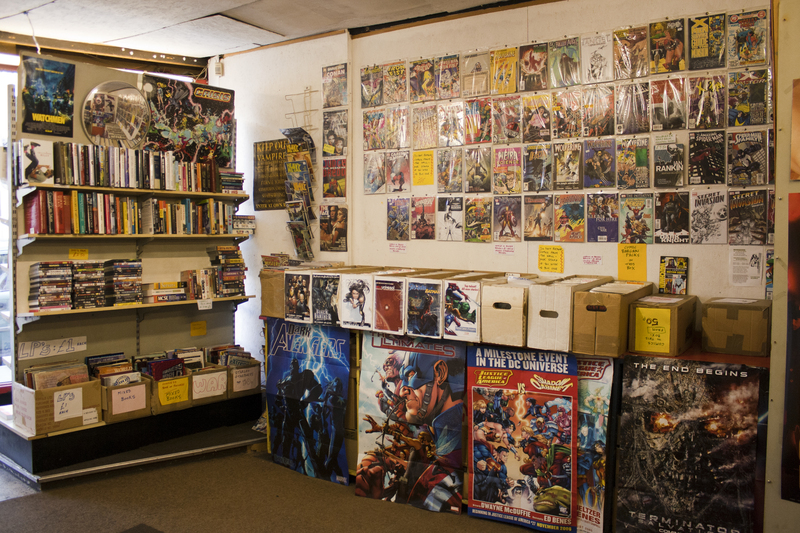 As well as books, Bookscene also has comics and magazines. The walls are plastered with colourful posters, making it a pleasant place to linger in, which seems to be what people do. In the few minutes I spent browsing the shelves, there were two other customers in the shop who both seemed to be on friendly terms with the man behind the counter. When I asked if I could take some pictures of the shop, the bookseller was lovely and polite. So, it looks as though I now have a local, affordable bookshop to run to when I need a new book! I lived in Nottingham before I moved to London, have you visited Jermy & Westerman on Mansfield Road? It’s one of the those secondhand bookshops where books are crammed into every possible bit of space. They also have an old fashioned till and it’s worth buying something just to hear the noise it makes. I used to live near Bookscene too, you’re making me a little homesick! I have been meaning to go there. I go past it on the bus sometimes, but just have never got around to going in. I’ll make sure I check it out soon! I use this shop for my comics,Tom the shop owner sends them on to me (im in Wakefield)every month, I do my ordering via email and by by bank transfer. I have been doing this for around 12 years and your photos are the first time I have seen the shop thanks for that. That’s OK! Glad you like the pictures. It’s always nice to know where you are getting things from. 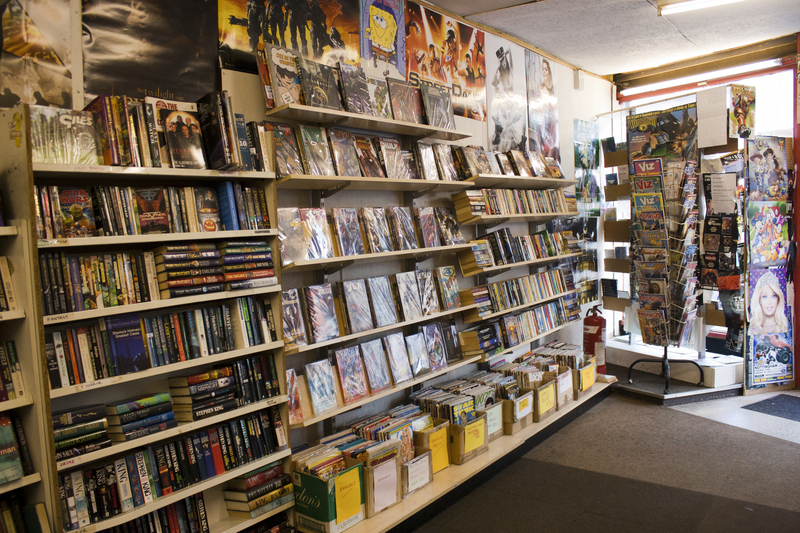 If you are ever in Nottingham you should check it out and browse the shelves! I work in a used bookstore here in the Atlanta, Georgia area. On my first day I brought home a 1st edition of 1984 (hardback, perfect condition $2), a 1st edition of American Ideals by former US President Teddy Roosevelt (also nearly perfect for 111 years old and $2), and a crate of books that we’d have thrown out otherwise (Shakespeare, George Bernard Shaw, and others). We charge about 60% off the original price, plus I get 50% off, plus 30% off. My job entails occasionally checking people out while reading anything and everything I want. It’s the perfect job. When I was a student, I lived just a couple of streets away from where this shop is now – I would have practically lived in there if it had been there then! Probably a good job, I suppose…much less studying would have got done if I’d have had this to tempt me away! I know, I’m going to have to limit myself to only buying one or two books per visit. At that price it’d be easy to buy five or six books a time! There isn’t much better to me than a good used bookshop. There aren’t very many left in my area. Wish I lived in the UK! Thanks! I know, I’m so happy I found this one…and so close too! A good selection. I love books, I love the way the smell and the ay they feel. Thanks for visiting my blog and for taking a little time to leave a comment. Thanks! I’m sure I will enjoy reading them!